Over the past three days, clashes in Tripoli have gravely endangered the lives of local residents and an estimated 8,000 refugees, asylum seekers, and migrants who have been trapped and arbitrarily held in detention centers throughout the city, the medical humanitarian organization Doctors Without Borders/Médecins Sans Frontières (MSF) said today. These same policies prevent people from crossing the Mediterranean by having the European-sponsored Libyan coast guard return people rescued at sea to Libyan shores. 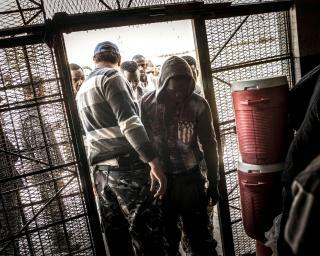 The vast majority of detainees have been intercepted at sea and returned to Libya, exacerbating the poor conditions in Tripoli’s already overcrowded detention centers. The situation has deteriorated over the past few months as detainees suffer the physical and mental health consequences of their limited access to clean water, sanitation, and health care.